By Marina Aagaard, MFT. Photo: Henrik Elstrup and Marina Aagaard. 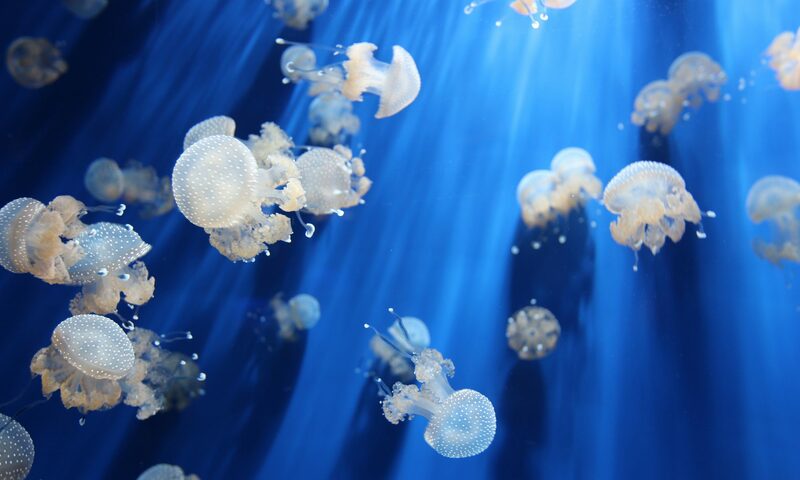 The journey is an experience in itself. Today a long road trip in the desert awaits. No problem. It is 450 km sightseeing. In a fine driving machine. It is morning. We train, eat breakfast, pack the car – say goodbye to Coral Muscat Hotel – and drive out of Muscat city. We are heading back for Dubai. Mosques dominate the landscape in Muslim countries and they come in all sizes. 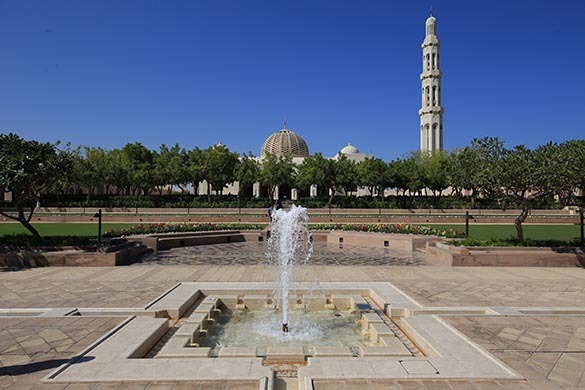 One of the larger Mosques is the Great Mosque in Oman. So on the main road out of Muscat, we make a stop. 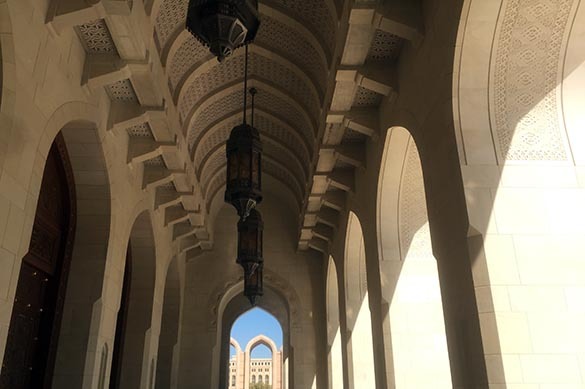 Sultan Qaboos Grand Mosque is the main mosque of the Sultanate of Oman. 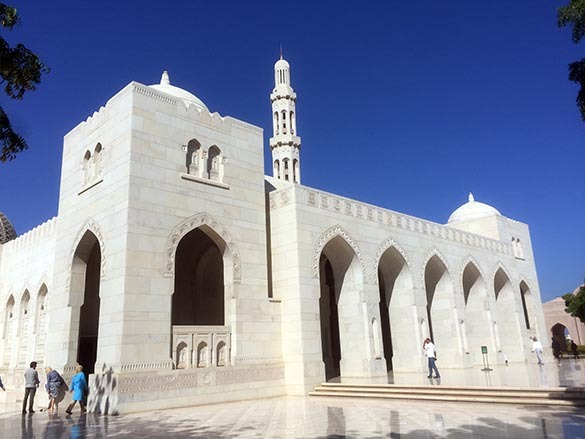 It was built from 1995-2001, 6 years and 4 months, and inaugurated by Sultan Qaboos of Oman. The building made of 300,000 tonnes of Indian sandstone is impressive from the outside and the inside. 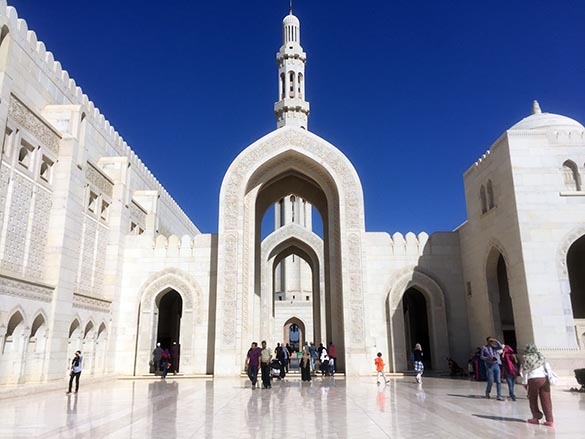 The mosque can accommodate 20,000 tourists or worshipers at a time. 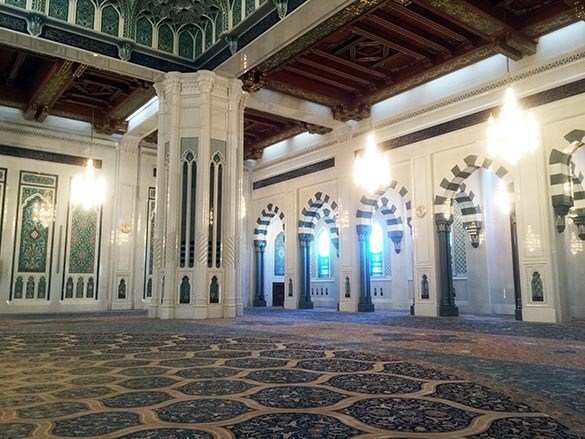 The central building, prayer hall (Musalla), is 74.4 x 74.4 square meters. In the middle a large dome, 50 meters in height. Additionally there are four small minarets of 45.5 meters, and a large one at 90 meters. 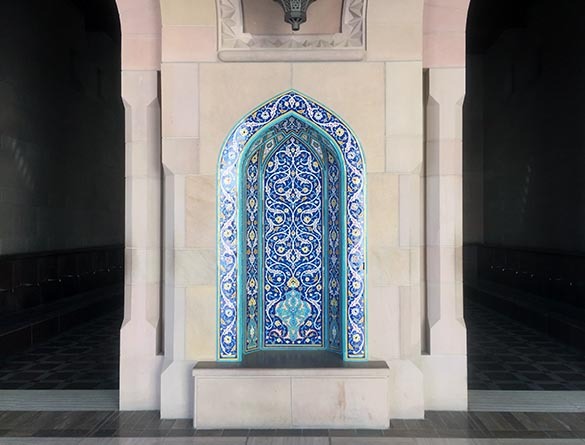 The highly polished lint-free stone tiles are shining; the mosque is reflected in them. Outside of the central building there are squares, colonnades, halls and a garden with flowers of all colours and small fountains. 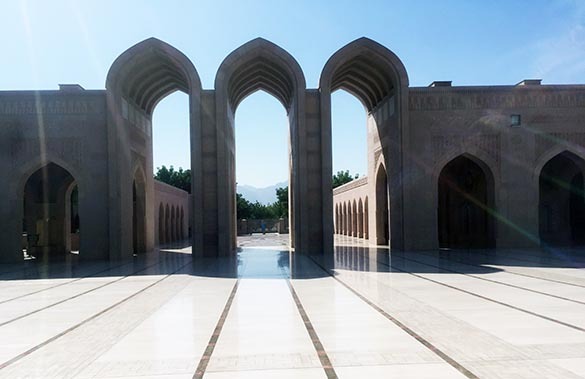 Between the arches and gates you can catch glimpses of the mountain range Al Hajjar Mountains. Everywhere in the otherwise flat landscape you see the dark mountain peaks forming a jagged pattern against the blue sky. Before entering the mosque, we take off our shoes and put them in small wooden compartments by the entrance. We are wearing full body-covering clothing and ready to step inside. 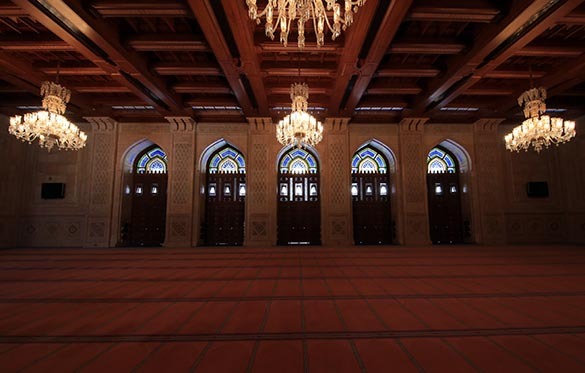 First we enter the women’s prayer room; a rather dark floor with brown wood paneling, red-brown carpets and large glass chandeliers. 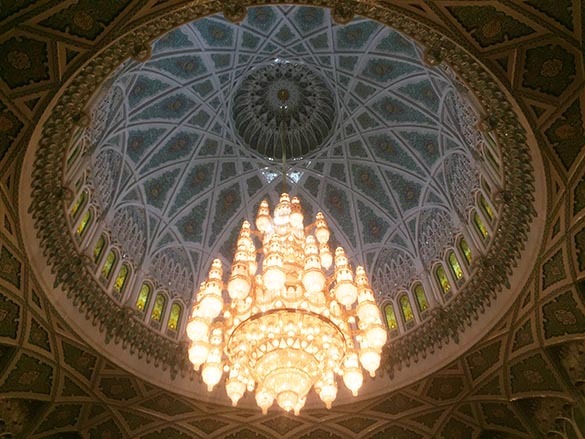 In this very large prayer hall there are several crystal chandeliers; in the center of the great dome, there is a 14-meter giant work of art created in Italy by Faustig. 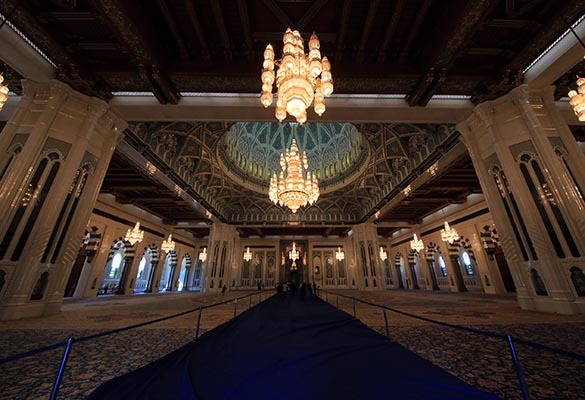 Even greater is the prayer hall carpet in 28 colors and many more shades: Made of 1.7000000000000 knots and weighing 21 tonnes. It took craftsmen in the Iran Carpet Company four years to make the carpet; the second largest carpet in the world (Wikipedia): Impressive 70 × 60 meters, covering 4,343 sqm. The pillars, too, are unique: Huge, yet elegant, shaped as a number of smaller columns. A myriad of patterns and color combinations. 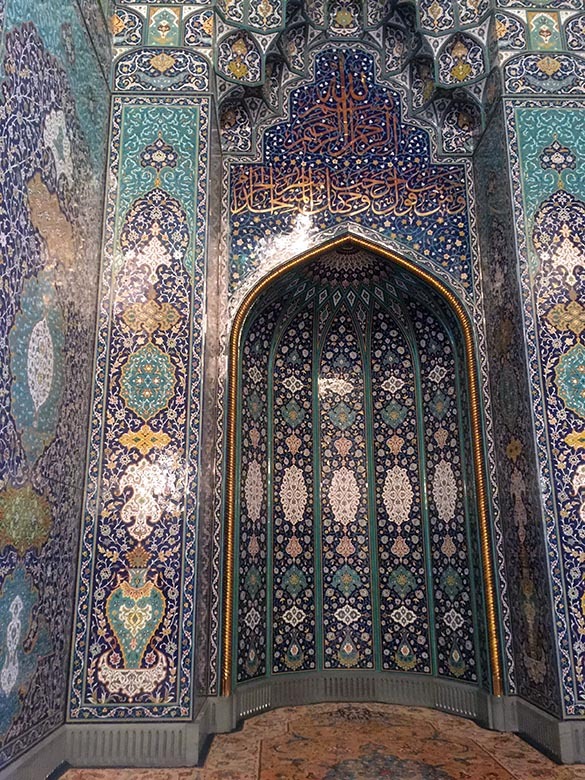 Islamic art is like a One Thousand and One Nights story, enchanting, and as far from minimalist Scandinavian design as you can get. You want to continue looking. But now the head-guard becomes insistent. We must leave the mosque. A small army of workers have already started removing the protective blue dress from the floor, the marked ‘tourist routes’, and rapidly remove the many stands with ‘stay-out-ribbons’, which has prevented tourists from entering the carpet. The watchman ushers the last stubborn photographing tourists out. It is time for prayer. A mosque visit? Remember to check opening times, festivals, holidays and prayer times. Out in the heat again. We find the car, put the roof down, drive out onto the highway again in the direction of Dubai. 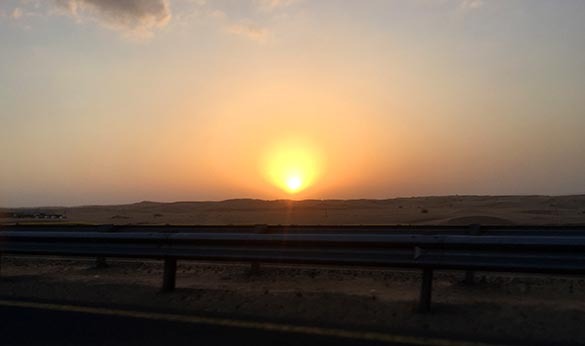 We get the last glimpses of the perfectly straight, flower flanked Oman roads and massive roundabouts and monuments. At the border again. Great success; the border is open and no queue. We drive past the first gate and continue to the next of the five controls; great: only a few cars in front of us. When it is our turn, we are waved away from the queue and into a parking lot. We need to go to the passport office to have passports and visas checked. In the office we wait patiently for our turn; the afternoon is still young. When we get to the inspecting officer he looks deadpan up from our passports and we get the laconic message: I need a stamp from the Oman checkpoint, you must turn around, go back to the Oman checkpoint and get it sorted out. After this mission is accomplished, we return to checkpoint number two, where the queue of cars now has grown considerably. We move slowly forward car by car. This takes a while. At the checkpoint we are again waved over to the side and the parking lot. From there we go back into the passport office and wait again. In the room we meet more people, who have had the same experience, so it is not just us, who are completely new to the border crossing technical finesses. Finally our documents are approved and we can go back to the car and drive on. 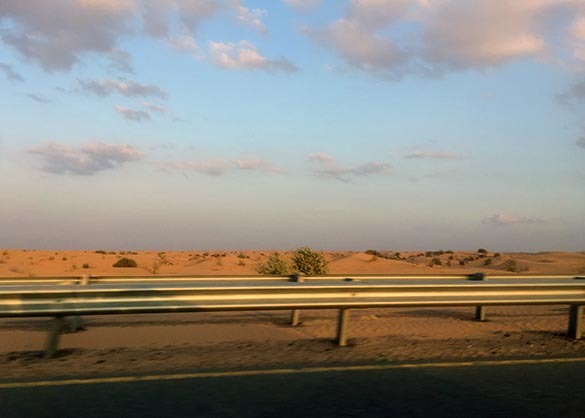 The first part of the trip, before we came to the border, we were driving north towards Sohar parallel to the coastline, so behind the flat, brown landscape with low buildings, we caught some glimpses of the glittering, blue sea. Later we turned west and drove through a rugged landscape with dramatic mountains in the background. 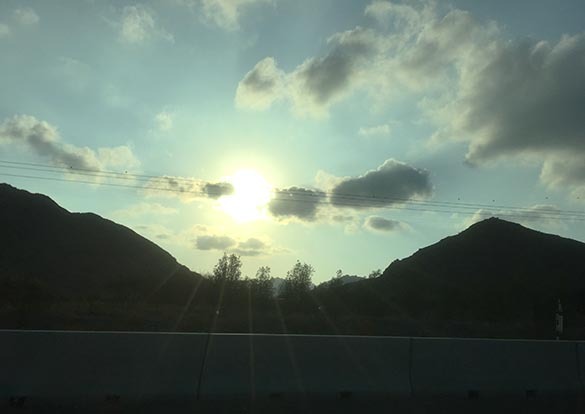 For a small part of the trip we were driving in the mountains in the late afternoon sunlight. We drive at a leisurely pace of 120 to 140 km/h. There is a bit wind and the sand from the desert is blown onto the road and forms small dunes of sand. 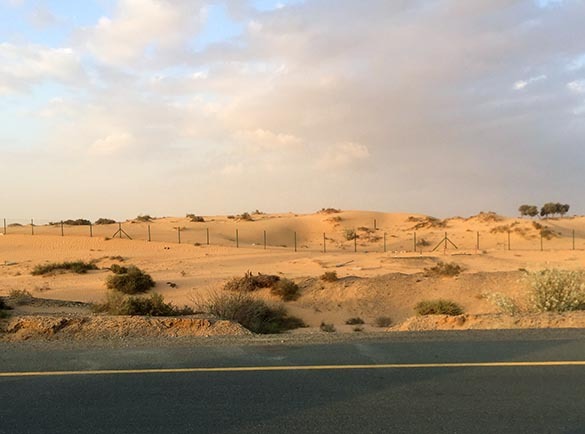 In the distance we see more cars drive around in the large desert sand dunes, but we also see car parts by the roadside. 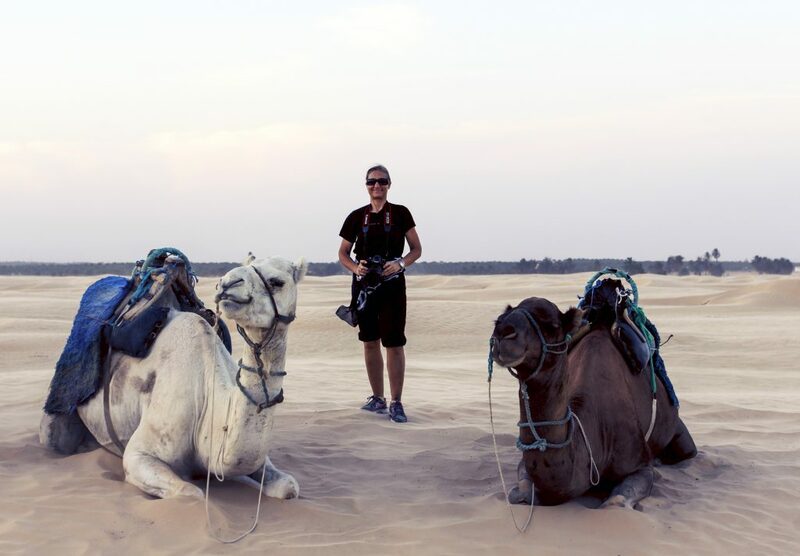 Desert driving requires an experienced driver. Suddenly we see blue flashing lights, signs with information about a detour and parked cars in three lanes. It obviously is not an easy drive today. We turn around and drive for several kilometers to find another way. This route is closed, too. We turn around again and third time is a charm. We roll down the ramp and onto the six-lane Dubai highway. It is completely dark before we are back in the apartment in JBR, Dubai. Since it is too late to go out to dinner, our friend and friendly host suggests takeaway de luxe from restaurant Paul nearby. Eating in has its advantages. Suddenly we hear loud noises. Fireworks? In Denmark it is only allowed for a few days around New Years Eve, so this is unexpected. In Dubai Marina, there are fireworks several nights of the week during winter season. A festive finale to a long day.